Jyggalag is the Daedric Prince of Order, but until the Third Era not much was known about him in Tamriel beyond his name. He represents logical order and deduction, and has taken account of every detail of the world and of every action that has ever taken place on Mundus or Oblivion, long before they actually happened. Jyggalag commands his own Daedra, the Knights of Order, which are spawned from obelisks summoned by his followers, the Priests of Order. In the time before recorded history, Jyggalag's realm of perfect order expanded across the seas of Oblivion, and the other Daedric Princes had grown fearful and jealous of him. They cursed him to live as Sheogorath, the incarnation of the thing he hated most: madness. He was, however, allowed to return to his true form at the end of every era in order to retake the Shivering Isles from his mad alter-ego in an event known as the Greymarch. However, once this was done, Jyggalag transformed back into Sheogorath, starting the cycle again. At the end of the Third Era, a mortal Champion of Sheogorath was given the chance to defeat Jyggalag, halting the Greymarch before he could conquer the realm. This supposedly released Jyggalag from his curse, allowing him to remain in his true form. The Champion then assumed Sheogorath's position as the Daedric Prince of Madness, and Jyggalag departed to roam the voids of Oblivion. The Dunmer Talym Rend defeated Sheogorath at his own game when he forced him to relive his memories as Jyggalag. Sheogorath keeps his memory of his previous life as Jyggalag suppressed as it causes even him to go mad. Dyus of Mytheria was the chamberlain of Jyggalag and the keeper of his Great Library. What exactly Mytheria refers to is unknown, though it may have been the name of Jyggalag's realm. Sotha Sil noted that of all the Daedra, only the "Gray Prince of Order" knew his nature, and went mad in the knowing. It is said that the Daedra fear wisdom and order, and for his similarities to Jyggalag's principles, they feared Sotha Sil above all others. The Sword of Jyggalag is a Daedric artifact created by Jyggalag, the Prince of Order. It takes the form of a giant unenchanted claymore made of a silver crystalline material, similar to the longswords wielded by the Knights of Order. It has been compared to the Staff of Sheogorath, although it is unknown if the sword holds as much symbolic power. The sword was originally wielded by Jyggalag himself. 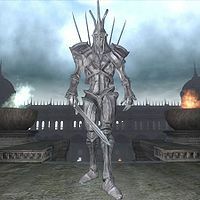 During the Greymarch of 3E 433, Jyggalag used the sword in his final assault on the Palace of Sheogorath, where he was defeated by Sheogorath's mortal Champion. Free of his curse, Jyggalag departed the realm to roam the voids of Oblivion, and his sword was placed in the palace's throne room as a trophy. For more information see the Shivering Isles page. This page was last modified on 2 March 2019, at 22:16.